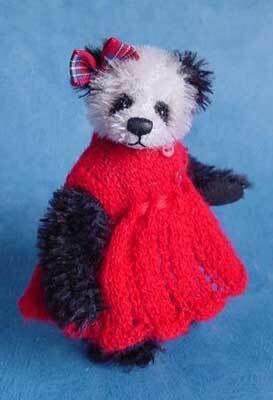 Maria Adams is a teddy bear artist of many years. Her bears come under the banner of 'Bears by Design' and although Maria is no longer making many handmade bears, she continues to be creative. In my quest to find the best bear artists and bring you their story via a short interview Maria's bears caught my eye and I hope you agree that her bears are simply stunning. When did you first decide that you would like to make teddy bears, and what was your inspiration? I became interested in old bruins and collectors’ bears in the late 1980s, when a friend sent me some specialist magazines. Having been a collector, and an enthusiastic needleworker for many years, a meeting with a member of the British Teddy Bear Association at a needlecraft fair encouraged me to try making a traditional bear myself. Tell us about your career as a teddy bear artist. I understand that you have been very successful, and sold your bears all over the world. 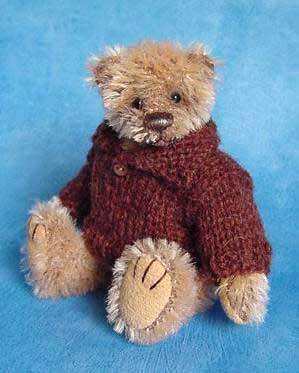 I started by making larger mohair bears, but as a keen miniaturist it was only a matter of time before I started making the miniature bears in mohair and upholstery velvet for which I became known. I used to sell my bears mainly at the major UK bear shows to visitors from all over the world, and through a number of shops, including Teddy Bears of Witney, who would also send them out worldwide. I also designed a bear to be manufactured and sold by a German company in Britain and Europe. I know that some bear makers plan each bear methodically before they make them: what they will look like and what their character will be. How do you go about making a bear? I have only a vague idea of what I’m aiming for when I start to make a bear: for example, a long snout, small or large ears, a long or short body and limbs, all of which I can draft out on a pattern. The bear really begins to come to life when I start on the head: placing the eyes and ears, embroidering the nose and mouth, and needle-sculpting the face all add to the character. Sometimes bears have a way of developing their own characters. 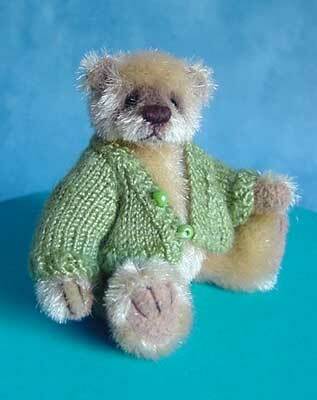 Of all the bears that you have made over the years, do you have a favourite one that you have kept for yourself? There are only two of my bears that I’ve kept for myself: Hamilton, who won an award at the British Bear Artist Awards, and Noel, whom I made as a present for my mother, and who has recently returned ‘home’. Have you always been a creative person, and have you expanded into other creative areas apart from bear making? I have always enjoyed arts and crafts, and since problems with my hands have forced me to give up bear making I have renewed my interest in altered and mixed-media art. I also love to make cards, small books and art journals. 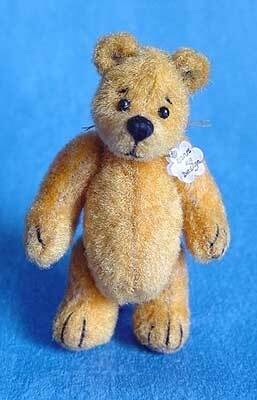 Did you have a favourite bear as a child? If so, do you still have it, and could you tell us about it? I never had a bear when I was young, and perhaps that’s why I became a bear collector when I was older. If you could give only one tip to someone who is planning to make their first bear, what would it be? One tip that I’d give to anyone planning to make their first miniature bear is to put in one small stitch at the front and back of the foot pad, and then to work your way from front to back on each side. That way you’ll get it symmetrical even though it’s too small to pin. Are You A Teddy Bear Artist? If you are a bear teddy bear artist or know of someone who makes handmade bears and who would like to have their own interview page, please feel free to contact me and let me know.